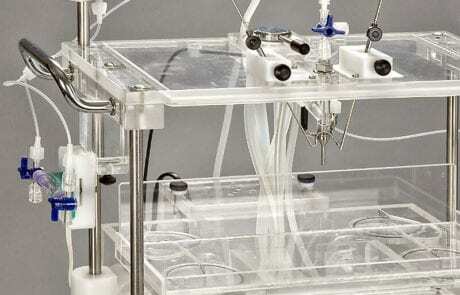 The compact pump-controlled heart perfusion system is a closed, integrated system, which is placed in a water circulating, self-thermostating liquid tank. 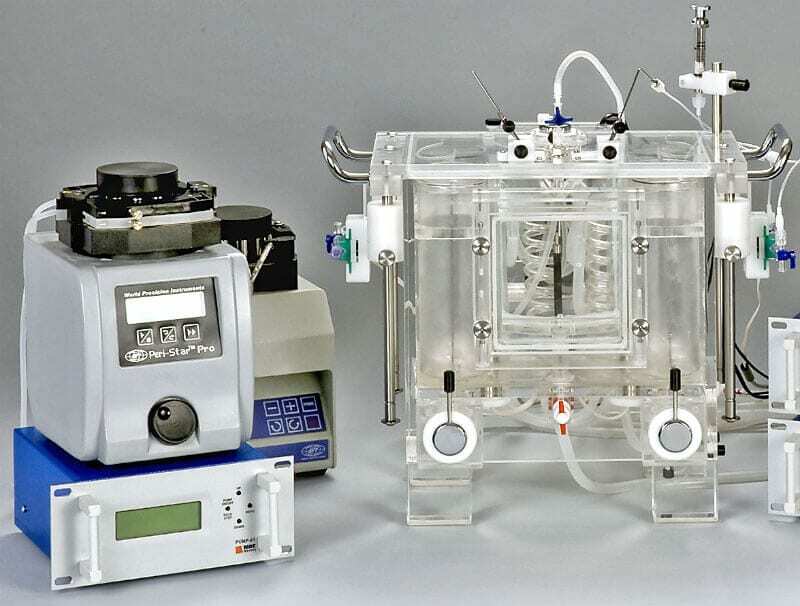 The tank contains two pieces of one liter reservoir with saline, an organ chamber holding the heart preparation and the specially designed, removable heart suspending unit. 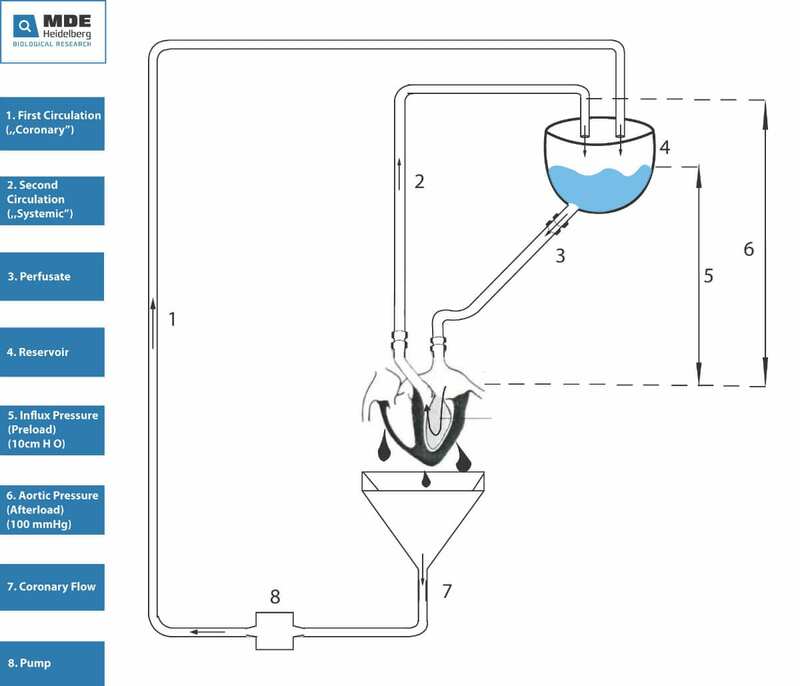 The technical solution of the water bath makes the system completely independent from the ambient temperature. 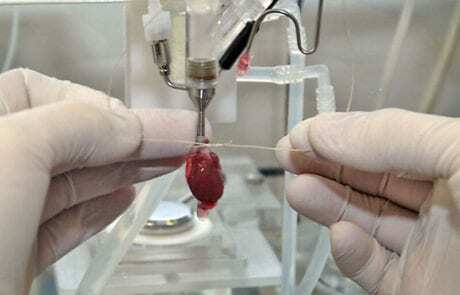 The system can keep a 0,01ºC accuracy, which provides an extremely stable environment for the heart. 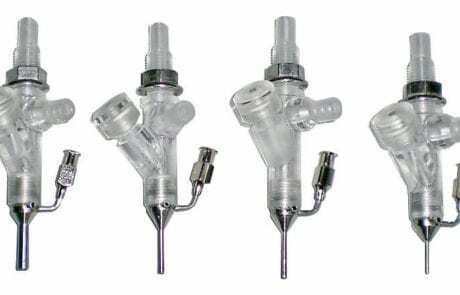 Another advantage is the removable heart suspending unit, which provides the most optimal suspension for the heart of laboratory animals. The measurement points (BP, temperature, etc.) 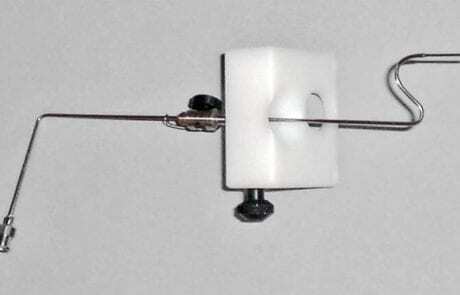 and the inlet channels are situated above the heart suspending cannula, which increases the accuracy of the measurement. 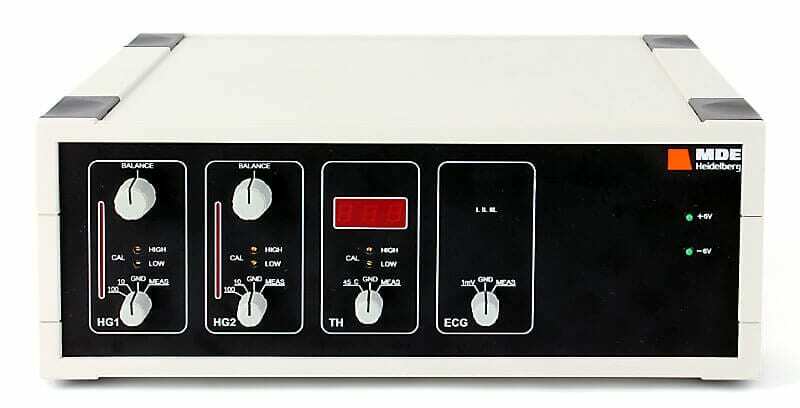 Beside its minimal space requirement the system is suitable to perform constant pressure and flow, as well as Janicki-type working heart measurements. This system is completely unique compared to other devices on the market. The system has to liquid reservoirs. Each reservoir can contain 1000 ml saline, which provides a two litre liquid background for the experiment with the continuous rollback. 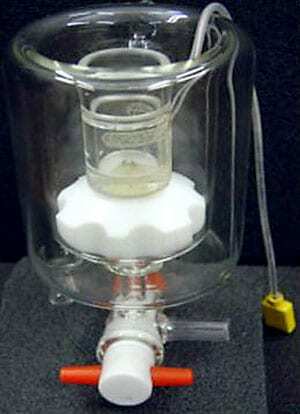 The two reservoirs can be used independently. In this way the effects of the same compound can be tested in two different doses, or the effect of two different compounds in succession. The substance quantity required for the experiment can be significantly reduced with the small dead volume, which also substantially reduces costs (e.g. : in case of especially expensive or exotic compounds). A tap placed on the closing cap between the columns provide the shift. 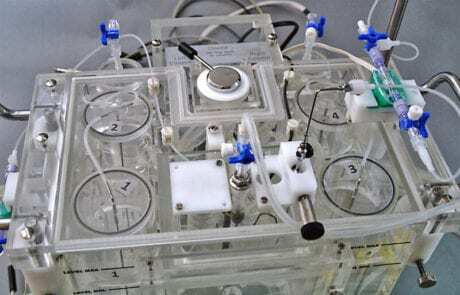 It is a basic requirement for the measurements to keep a constant pressure in the system and reduce the resistance of the variable flow and the pulsation of the peristaltic pump to a minimal level. 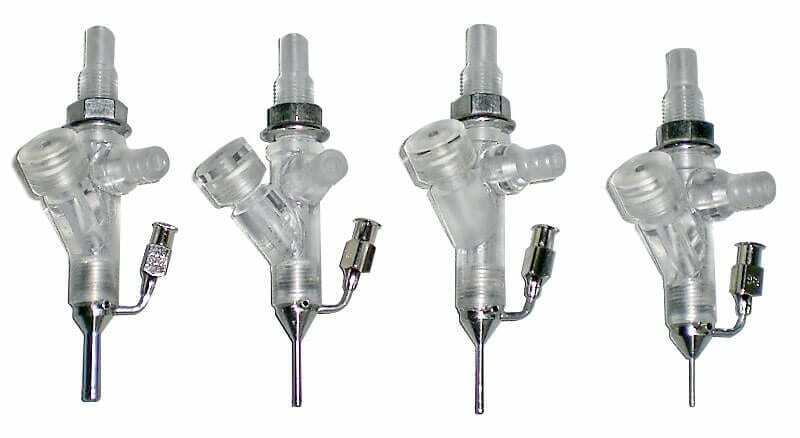 To maintain the accurate measurement the controller (and through this the pump) is operated by the sign of the pressure sensor, which is placed above the heart suspender cannula. 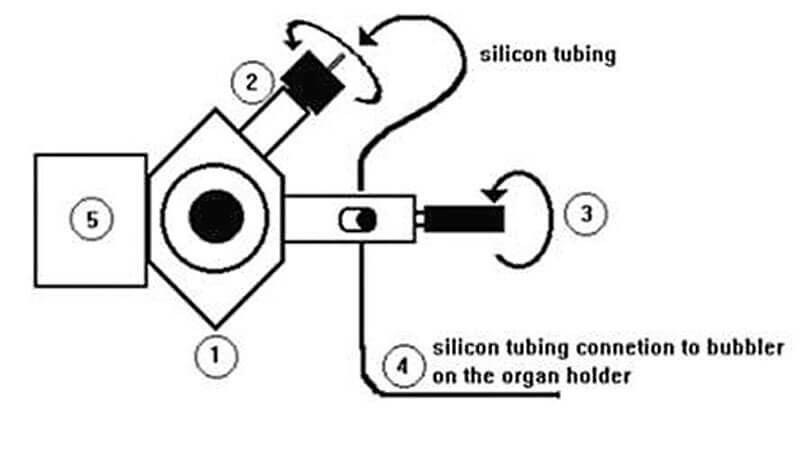 The operation of the controller is presented in the figure below. 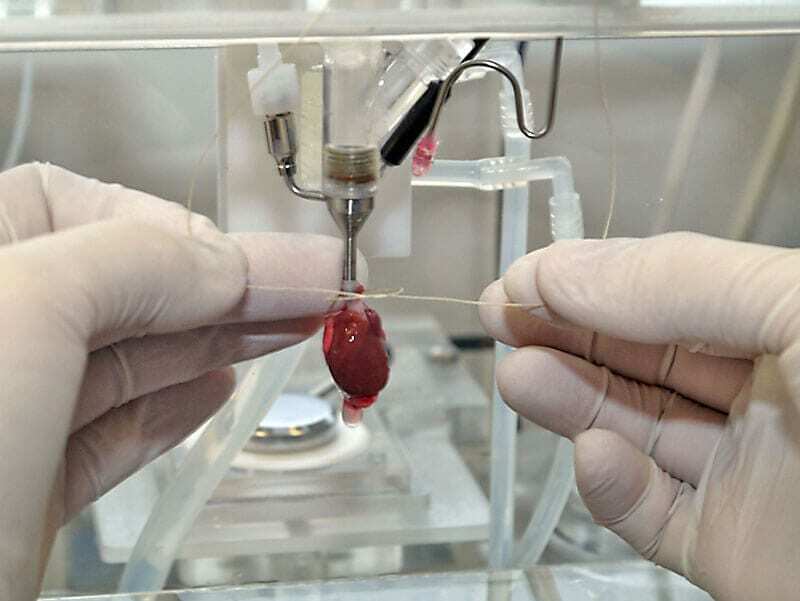 We tried to develop a heart suspender, where the preparation can be placed on the heart suspending cannula as quickly as possible, without causing any damage. For this reason the end of the cannula is notched, helping the stability of the placement and the positioning of the binding thread. The cannula is design in the following sizes; Ø4.5, Ø3.0, Ø2.0 and Ø0.9 mm, taking into account the species and its weight. One of the most significant advantages is that the measuring point and the inlet channels are situated directly above the dissection leaving only a minimal dead space. 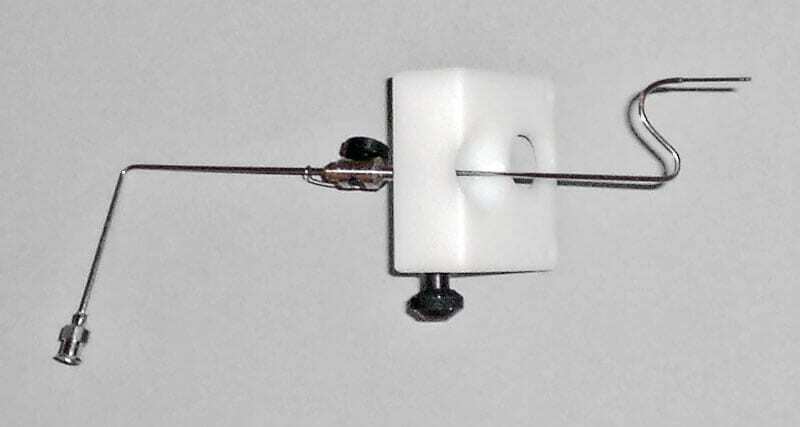 The cannula built in the ball manipulator is the most significant component of the Janicki-type working heart unit, since it can be moved vertically and in a 60o angle. 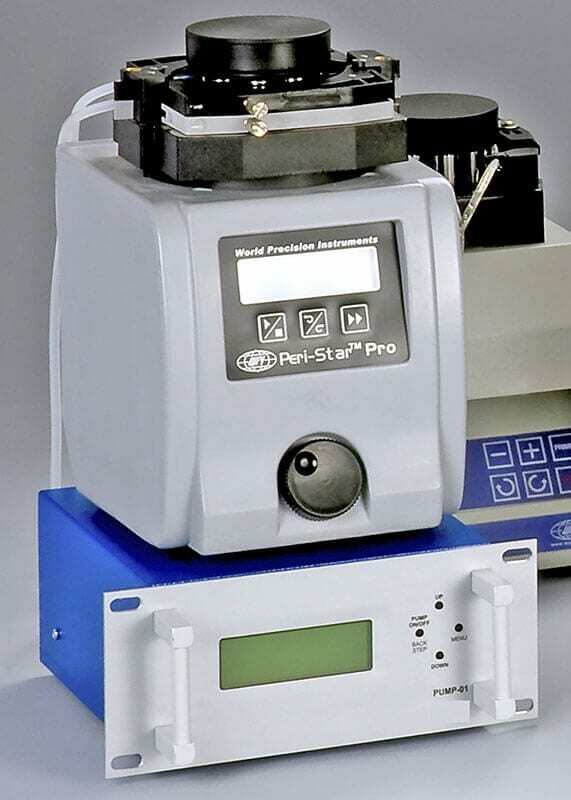 The system allows one-point extra-/intracellular MAP measurement and stimulation, built in a 360o adjustable ball manipulator. The manipulator can be organically connected to the system. The eight-point non-invasive measurement is a unique development of our company. 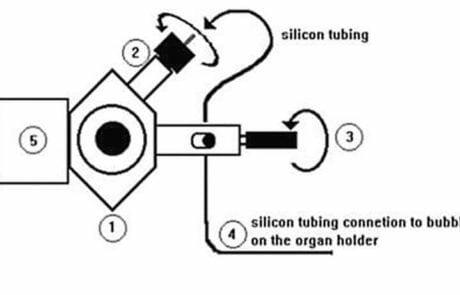 The preparation is placed in an organ bath filled with saline soultion, surrounded by the MAP sensor. The sensors detect the MAP signals through the solution, which are detected by a specially designed biological amplifier. For this purpose we designed a multi-position, high-quality and long-wearing tap. The essence of the construction is that the material combination of the tap allows appropriate grip surface, gapless sealing, and allows smooth closing/opening movement. 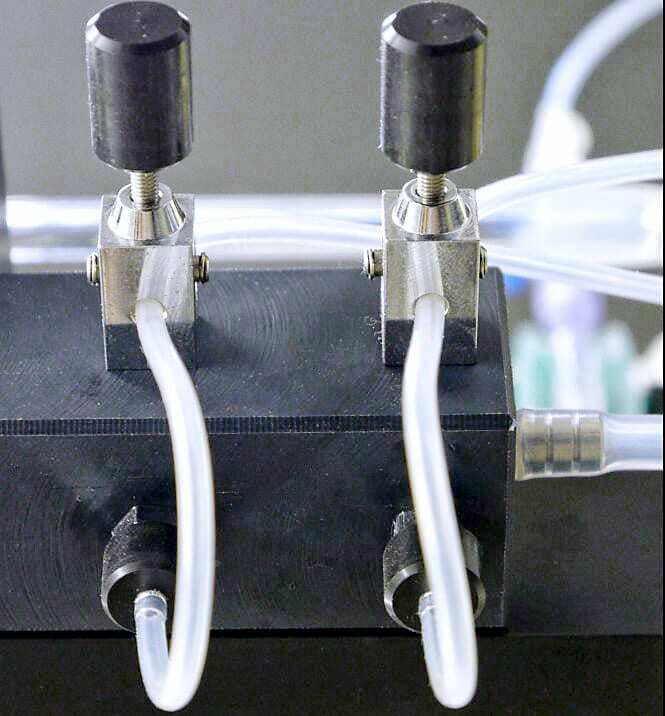 Moreover, contrary to other systems’ taps, it does not have two positions (open/close), but it closes continuously.The taps are essential parts of the system, which lead the saline to the preparation. 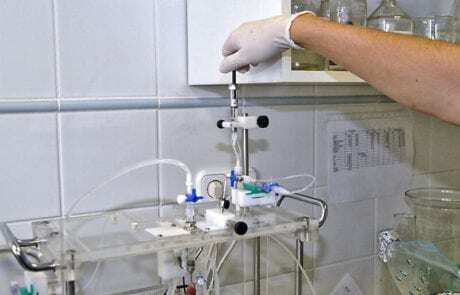 For the appropriate operation of the heart, appropriate quantity and quality carbogen gas is necessary being dissolved in the saline solution. 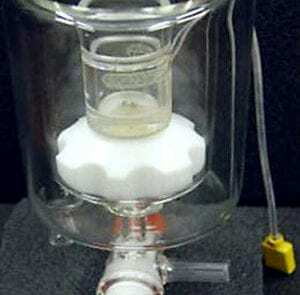 For the necessary dispersion we developed a gas vaporizer and fine tuning device. The gas flowing through the redactor of the bottle, is collected in a windbag, and through a cylindrical clamp – a tube with appropriate wall thickness – the carbogen gas is vaporized into the solution. We deliver the system in a complete setup, which contains all the sensors and amplifiers necessary for pressure measurement and the measurement of MAP signals and the programmable isolator square-wave generator for the stimulation of the preparation. Before presenting the technical solution and the unique operation of each device, we represent the essence of the methodology with a brief historical overview. In case of the standard Langendorff heart the coronary circulator system is perfunded. The empty left ventricle contracts, but it does not pump any liquid. The preparation can be easily altered by installing a second perfusion circle, so the left ventricle can perform pressure work. These type of experiments were first documented by Ridler in 1932, and then by Heubner and Mancke in 1935. The detailed description was published by Neely in 1967. The following picture presents a simple theoretical drawing of the device. This simple solution was schematically resolved by the Bardenheuer and Schrader variation (1983), where they lead a balloon into the left ventricle. They do not measure the isovolumetric pressure, instead it pumps the liquid from the balloon into a closed extracorporeal system. Because of the two non-return valves, the liquid can only flow in one direction. 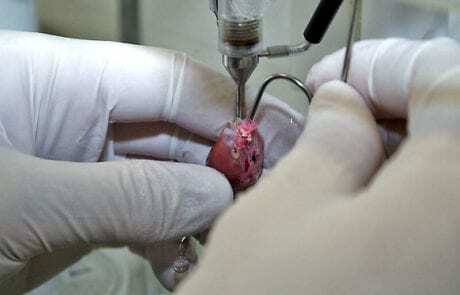 Upon every stroke the content of the balloon is squeezed out, which is identical with the stroke volume of the heart. Preload and afterload can be adjusted separately. The flow of the completely separated saline (retrograde in the aorta through the coronaries) is registered quantitatively. 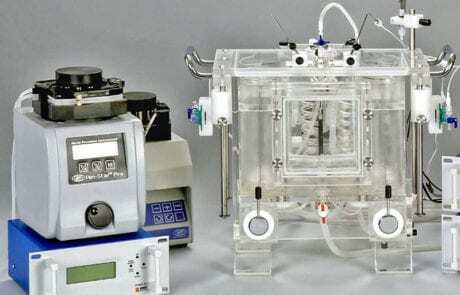 In this way the biochemical and biophysical circulation of the system can be separately analyzed. 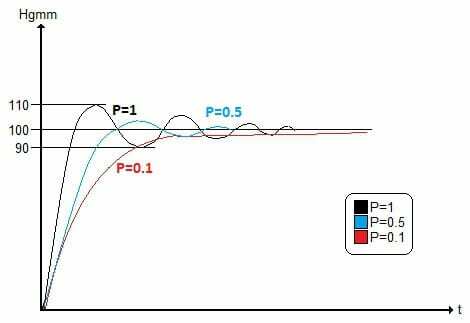 This preparation can be useful to examine the pressure-volume work of the heart and the biochemical parameters of the saline in the coronary (e.g. : O2 consumption, metabolism). A modified Langendorff (Janicki et al. (1974,) Weber and Janicki (1978)) is used for simple hemodynamic-biophysical observations (e.g. : relations of the ventricle pressure-volume), which is similarly to previous descriptions utilizes balloon and separated circulation to maintain the coronary perfusion and pressure. In this case the pressure meter is connected to the balloon. The volume of the balloon is measured and regulated through reattachable electronics by the sensor. The systems are manufactured in one- and two-buffer designs. 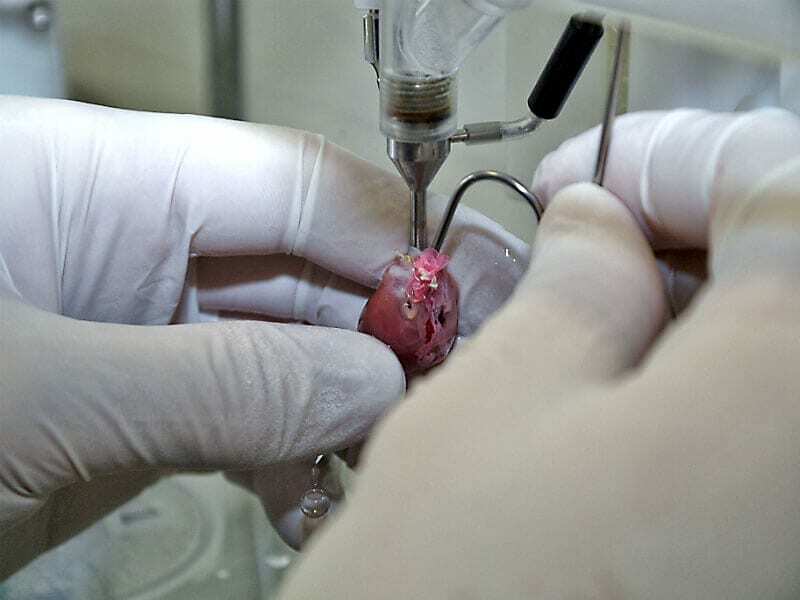 The constant pressure necessary for the operation of the dissection (mouse, rat, guinea pig or rabbit heart) are provided by the liquid column located in the reservoir. The advantage of the two-column design is that is can be used to examine the effects of the same compound in different doses or the effects of two different compounds successively. The liquid level is ensured by the overflow stub of the reservoir and the pump-controlled recirculation of the liquids leaving the dissection. Density and viscosity are provided by the material-combination of the flow-controlling taps, which make any other sealing-compound unnecessary. The design allows a quick and calibrated correction of wearings resulted from the use of the taps. The warmth of the system (0,1OC) is ensured by a high-flow rate transporting, 20 liters volume thermostat (CWB-02). 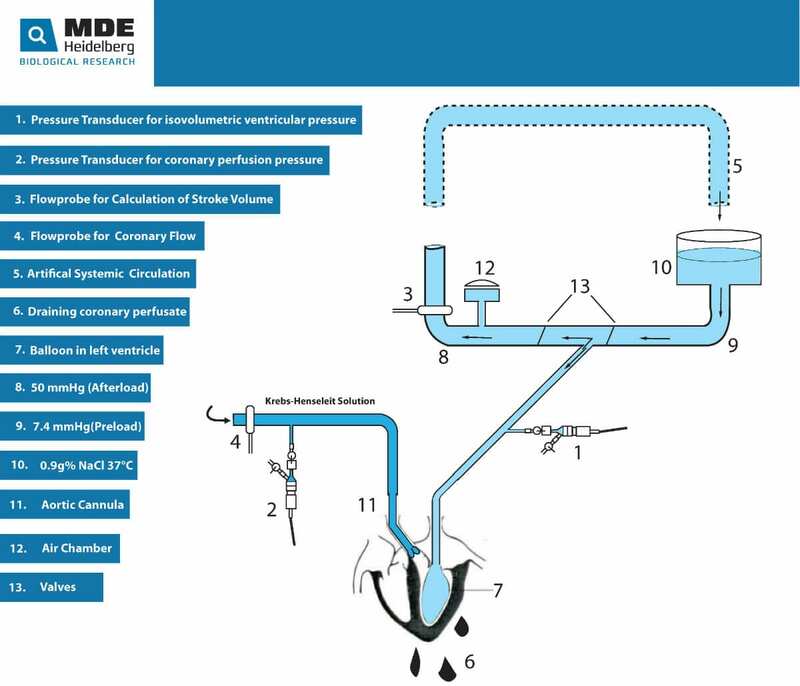 The positioning of the dissection is provided by an independent mechanism (heart suspension), which is connected to the liquid reservoir through the taps and the spiral heat exchanger. Upon the design of the heart suspender, a primary aspect was that the sensors of the continuously monitored parameters (e.g. : pressure, temperature) should be placed next to the heart. The pump-controlled systems have all the positive characteristics that we have mentioned in connection with the gravitational systems. Other advantages over those systems are that they require small space and the same device (pump) can be used for constant pressure and flow. 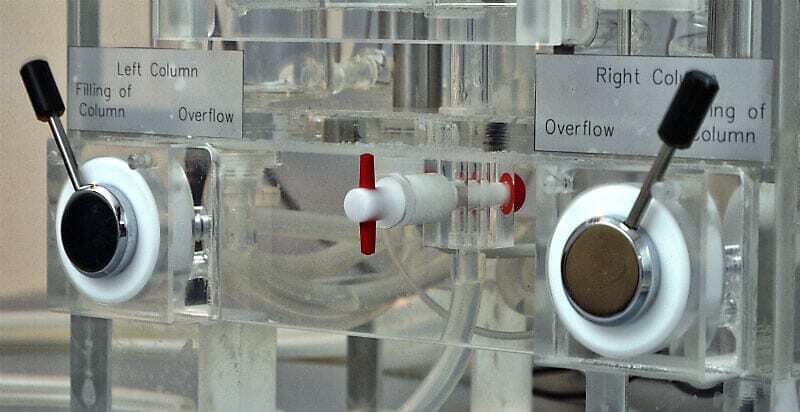 The retrofication of certain components of the gravitational systems resulted in the reduced size of the pump-controlled systems, which increased the stability of liquid-flow, while reducing the consumption of the saline and the examined compound. Pump-controlled systems are easier to repair and clean. 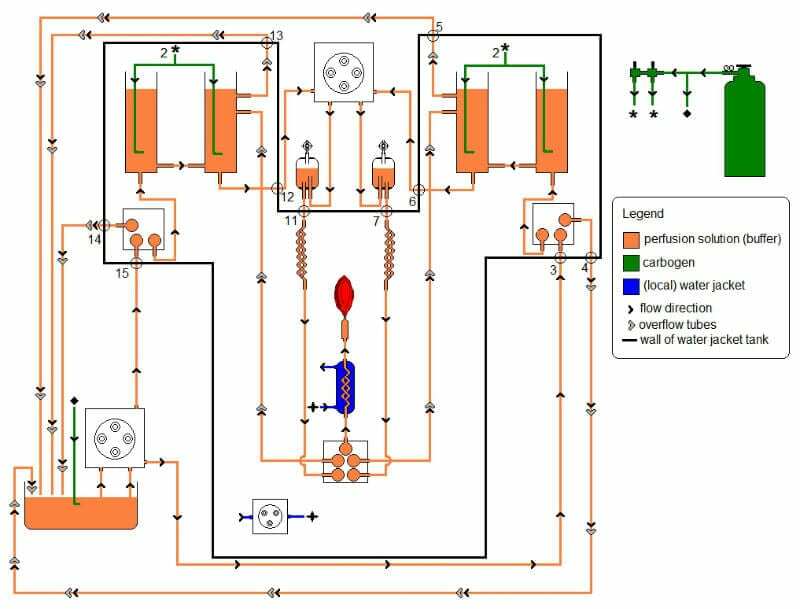 The compact pump-controlled heart-perfusion system is a closed, integrated system, placed in a water-circulation self-thermostated fluid tank. 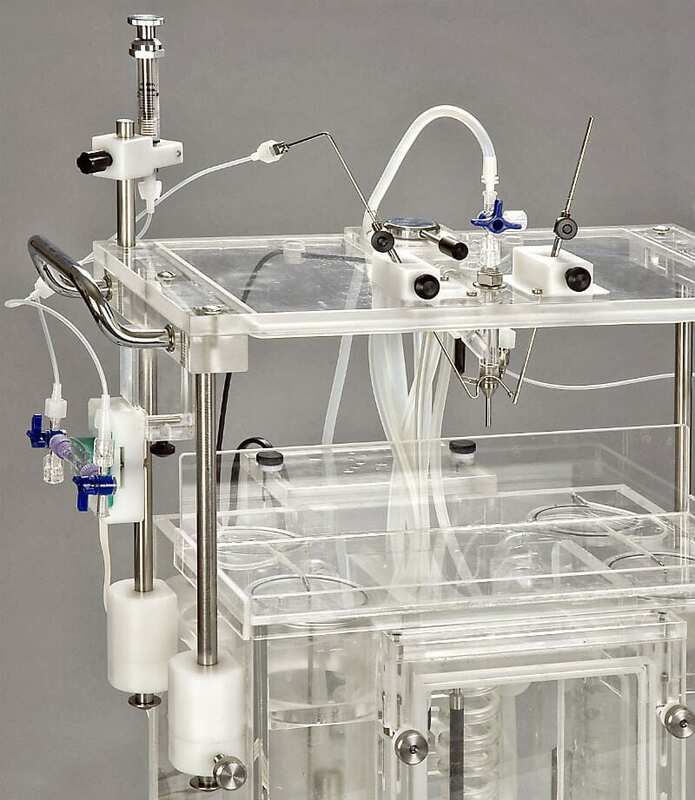 The tank contains two saline holding reservoirs, an organ chamber for the heart dissection and a specially designed, removable heart suspending unit. The water bath solution completely isolates the system from the ambient temperature. The system guarantees a 0,01OC accuracy, which provides an extremely stable environment for the dissection. 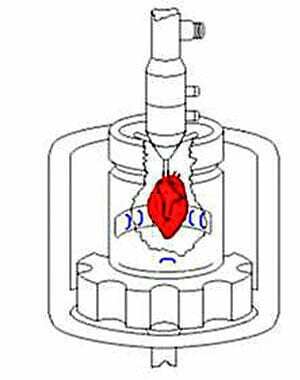 Another advantage is the removable heart suspending unit, which provides the most optimal suspension solution for laboratory animal hearts. The accuracy is increased by the fact that the measuring points (BP, temperature, etc.) together with the material inlet channel are placed directly by the stump of the organ suspender. 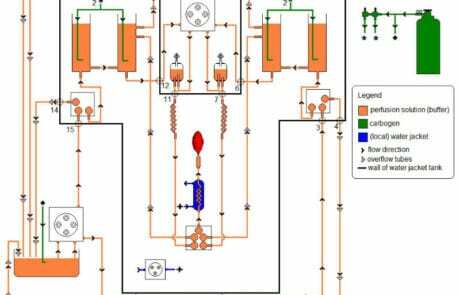 With the minimal space requirement, the system is suitable to perform constant pressure and flow, or Janicki-type working heart modes. The quantitative consumption of the saline and the examined agent highly prevails, since shorter internal phases reduce the path of the agent to the examined organ. Further elements (taps, gas vaporizers) have a similar solution to open system. These characteristics make the system completely unique compared to any other systems on the market. To detect the extra- and intracellular MAP sign, we developed constructions, which can be easily adapted to the systems. 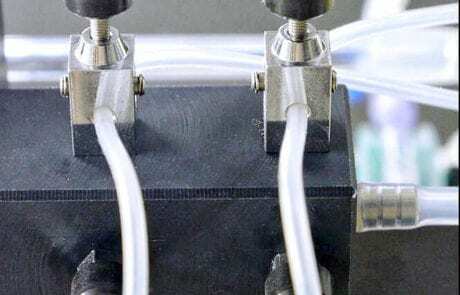 The electrodes can be easily connected to the mechanical surface of the systems, even posteriorly, and provide a possibility to arrange surface or intracavitary measurements. The eight-point non-invasive extracellular MAP measurement is a unique solution, where the heart in the organ chamber is surrounded by saline. 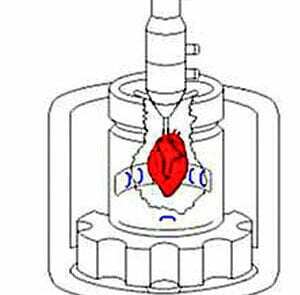 The heart is positioned by the specially designed chamber, which eliminates the negative effects of buoyancy. 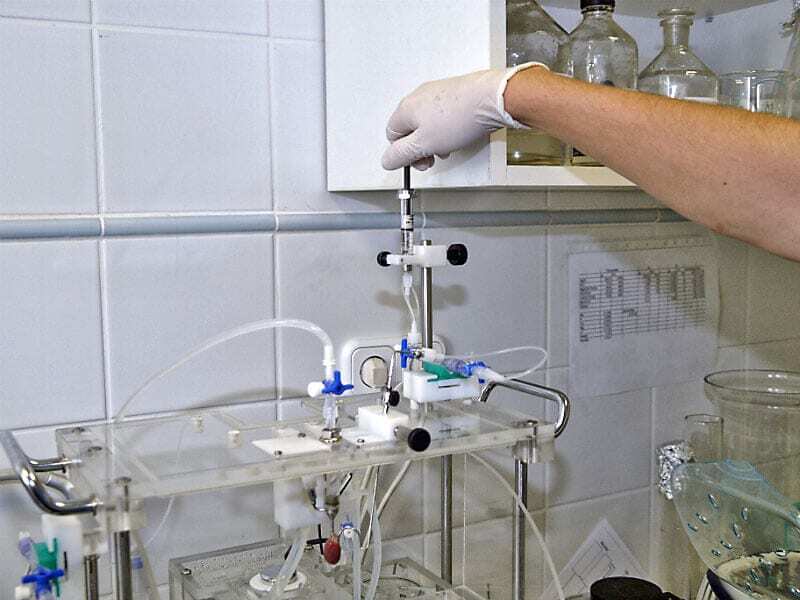 Further advantage of intra-liquid measurement is that tissue edema can be reduced, since the colloid osmotic pressure is balanced by the hydrostatic pressure of the container. This prolongs the life-expectancy of the dissection. Furthermore chamber extrasystole can be created by pulse impulses, helping the examination of different anti-arrhythmic agent effects. 2014 Rosic M, Parodi O, Jakovljevic V, Colic M, Zivkovic V, Jokovic V, Pantovic S. Glucagon effects on 3H-histamine uptake by the isolated guinea-pig heart during anaphylaxis Biomed Res Int. 2014;2014:782709. doi: 10.1155/2014/782709. Epub 2014 May 11. 2014 Jevdjevic M, Srejovic I, Zivkovic V, Barudzic N, Petkovic A, Bradic J, Djuric D, Jakovljevic V. The effects of Diclofenac and Ibuprofen on heart function and oxidative stress markers in the isolated rat heart Serbian Journal of Experimental and Clinical Research 01/2014; 15(1):11-19. 2013 Khobragade SB, Gupta P, Gurav P, Chaudhari G, Gatne MM, Shingatgeri VM. 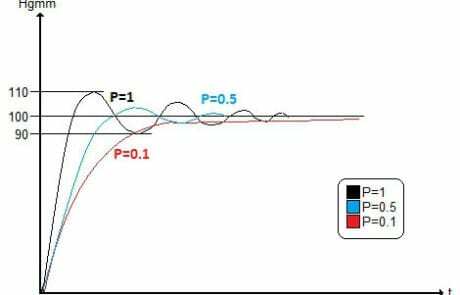 Assessment of proarrhythmic activity of chloroquine in in vivo and ex vivo rabbit models J Pharmacol Pharmacother. 2013 Apr;4(2):116-24. doi: 10.4103/0976-500X.110892. 2013 Zivkovic V, Jakovljevic V, Pechanova O, Srejovic I, Joksimovic J, Selakovic D, Barudzic N, Djuric DM. Effects of DL-homocysteine thiolactone on cardiac contractility, coronary flow, and oxidative stress markers in the isolated rat heart: the role of different gasotransmitters Biomed Res Int. 2013;2013:318471. doi: 10.1155/2013/318471. Epub 2013 Nov 24. 2013 Zivkovic V, Djuric D, Turjacanin-Pantelic D, Marinkovic Z, Stefanovic D, Srejovic I, Jakovljevic V. The effects of cyclooxygenase and nitric oxide synthase inhibition on cardiodynamic parameters and coronary flow in isolated rat hearts Exp Clin Cardiol. 2013 Spring; 18(2):e102-10. 2012 Zivkovic V, Jakovljevic V, Djordjevic D, Vuletic M, Barudzic N, Djuric D. The effects of homocysteine-related compounds on cardiac contractility, coronary flow, and oxidative stress markers in isolated rat heart Mol Cell Biochem. 2012 Nov;370(1-2):59-67. doi: 10.1007/s11010-012-1398-4. Epub 2012 Jul 22. 2009 Kónyi A, Skoumal R, Kubin AM, Füredi G, Perjés A, Farkasfalvi K, Sárszegi Z, Horkay F, Horváth IG, Tóth M, Ruskoaho H, Szokodi I. Prolactin-releasing peptide regulates cardiac contractility Regul Pept. 2010 Jan 8;159(1-3):9-13. doi: 10.1016/j.regpep.2009.07.009. 2008 Szokodi I, Kerkelä R, Kubin AM, Sármán B, Pikkarainen S, Kónyi A, Horváth IG, Papp L, Tóth M, Skoumal R, Ruskoaho H. Functionally opposing roles of extracellular signal-regulated kinase 1/2 and p38 mitogen-activated protein kinase in the regulation of cardiac contractility Circulation. 2008 Oct 14;118(16):1651-8. doi: 10.1161/CIRCULATIONAHA.107.758623. Epub 2008 Sep 29. 2005 Szenczi O, Kemecsei P, Holthuijsen MF, van Riel NA, van der Vusse GJ, Pacher P, Szabó C, Kollai M, Ligeti L, Ivanics T. Poly (ADP-ribose) polymerase regulates myocardial calcium handling in doxorubicin-induced heart failure Biochem Pharmacol. 2005 Mar 1;69(5):725-32. Epub 2005 Jan 12. 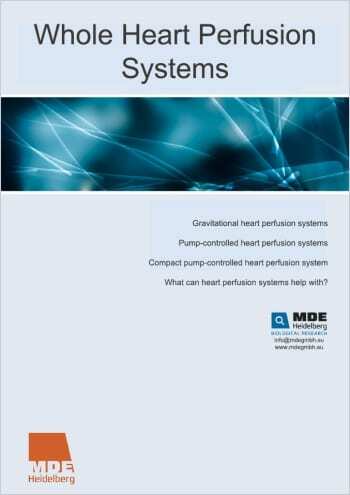 Note: experiments were performed with gravitational-type isolated heart perfusion systems.